At the very beginning of the press conference host Prof. Lubomir Stoykov, professor at the National Academy of Art, said: "Jivko Sedlarski has produced and continues to produce unique creations that reach millions of people around the world and fill them with wonderful energy. 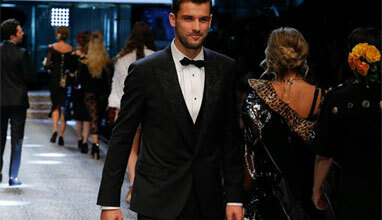 His aesthetic reading of the ladies' dress shows the power of inspiration which is one of the biggest fashion fetishes that can awaken in an artist. In turn, however, his works are also a catalyst for the imagination of designers and stylists, and act as a powerful impulse to create beauty. It is known that fashion is to a great extent dominated by space and a manifestation of virtuosity in shaping, and Jivko Sedlarski is a true magician in this respect. With temptation, his dresses created by haute soudure, ie. high-end weld, can compete with prototypes in haute couture." 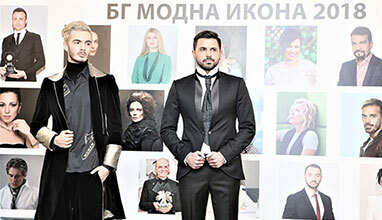 During the press conference Jivko Sedlarski presented a total of 15 sculptures from the series "Dress": "Rainbow in the Night", "Andromeda", "Breeze", "White Silence", "Viennese Waltz", "Stuttgart Stars", “Spiral Galaxy”, “Fisherman's Woman”, “Three Cheese Dresses”, and “Three Fleece Dresses”. The size of the sculptures is from 14 to 76 cm, and the materials from which they are made include: brass, granite, stainless steel and fiberglass. Jivko Sedlarski said that all his sculptures were cast in Bulgaria, although he himself lived and worked for more than 20 years in France. The artist's largest project, to be completed in 2019, is a fresco for two 840-square-foot pedestrian tunnels in China. This was announced by Jivko Sedlarski during the press conference and explained that the theme of one tunnel is "Ocean” and for the other -"Jungle" and it is planned to lead millions of tourists to the largest skyscraper in China (729 meters), which is also to be realized. Jivko Sedlarski's works are an original synthesis of fashion, fine art and architecture. The fashion galleries in Paris, Milan and New York are a source of inspiration for the sculptor who has made two reviews in France in 2017 together with a student of the designer Jean Paul Gaultier and independently in 2013 at the cathedral in the city Your view. The relationship between fashion and sculpture in his work, Jivko Sedlarski, opened in 2008 when he began working on his first monumental "Rainbow in the Night" dress of 3.20 m high stainless steel designed for a private park north of Rennes, France. With this sculpture begins the series "Dress" by Jivko Sedlarski, in whose creative pursuits the woman is always present. It is not represented physically in any of its works, but each one can visualize it in an associative way. In metal dresses, the woman is more a mystery and a silhouette, but it is the deity that the artist worships. Her energy and movement are captured in the sensual sculptures of Jivko Sedlarski, who seems to have a soul. His striving for beauty passes through the clean line and the simple form of figurative sculpture without the need for extra strokes, and as he himself explains, "I chose the dress because I wanted to recreate a movement unimpeded by details." 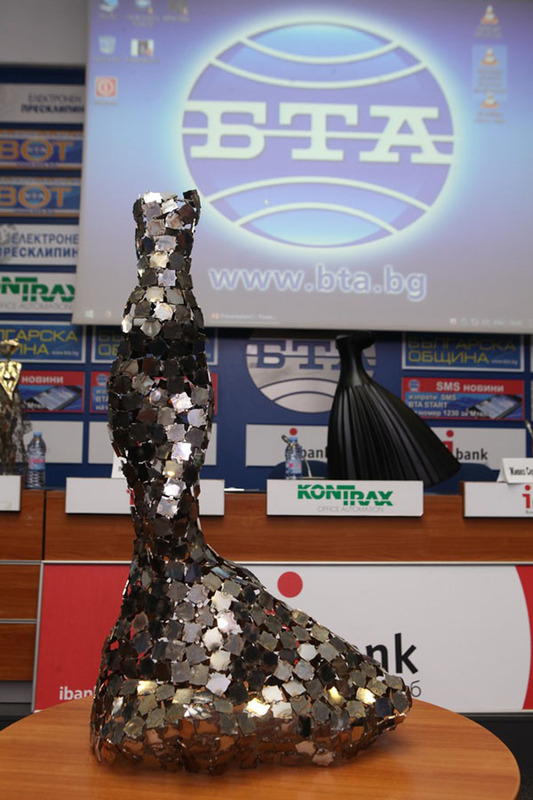 Assistants during the presentation of the sculptures at the Press Club of BTA were the top model Nicole Prediova and Antoaneta Boyanova - Lady Bulgaria World 2018. Jivko Sedlarski was born in Elhovo. He graduated from the School of Ceramics and Glass. He defends a degree in sculpture at the National Academy of Art. A curious episode in his biography is his training in anatomy at the Medical Academy under Prof. Palov. He also practiced at the Berlin Academy of Art. Since 1991 he lives in France and works in the field of monumental and small sculpture. His performances in solo and collective exhibitions, as well as his performances on sculptures, are on three continents and include, besides Bulgaria, countries such as Germany, France, Austria, Switzerland, England, Scotland, Belgium, Spain, Portugal, Slovenia, Slovakia, Estonia, Lebanon, Georgia, USA, China and others. Jivko Sedlarski is one of the three chosen European artists entered into the program of the Council of Europe Arts Club in 2007 and 2011 to participate in a representative exhibition. The sculptor's works are the property of many museums, galleries and private collections, and his sculptures are in parks, gardens, castles, beautiful houses and homes all over the world. Makes as a donation relief of Hristo Botev for the facade of the Bulgarian Cultural Center in Paris. His work is also the sculpture "Mother" (also known as the "Rose-Picker"), which is located at the entrance of the town of Karlovo and is a symbol of the Rose Festival and the city. Among the most significant appearances of Jivko Sedlarski is also at this year's participation in the international Ginger Lake Biennial in Suzhou, China. 1. 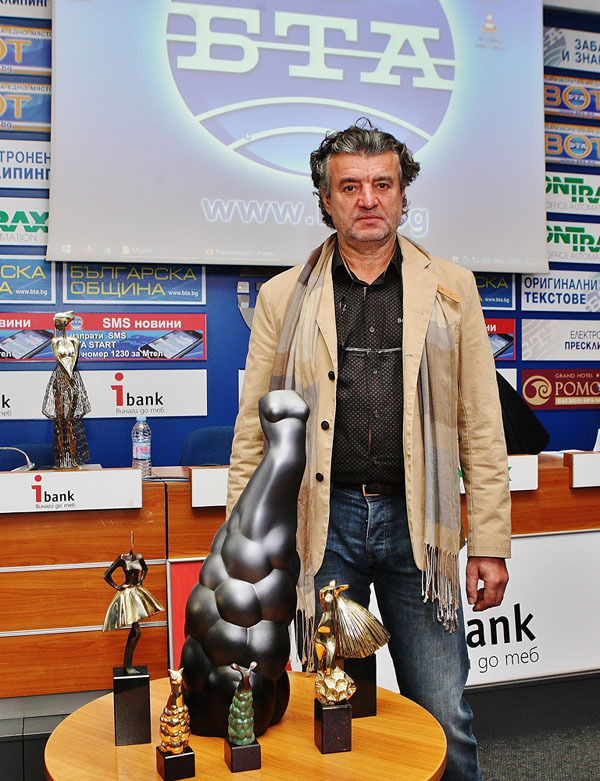 Jivko Sedlarski with the "Rain in the Night" sculpture. 2. Jivko Sedlarski with sculptures from the series "Dress". 3. Jivko Sedlarski and Prof. Lubomir Stoykov with the sculpture "Andromeda". 4. Jivko Sedlarski with Nicole Prediova (on the left) holding the Fucla sculpture and Antoaneta Boyanova (on the right) holding the sculpture "Spiral Galaxy". 5. 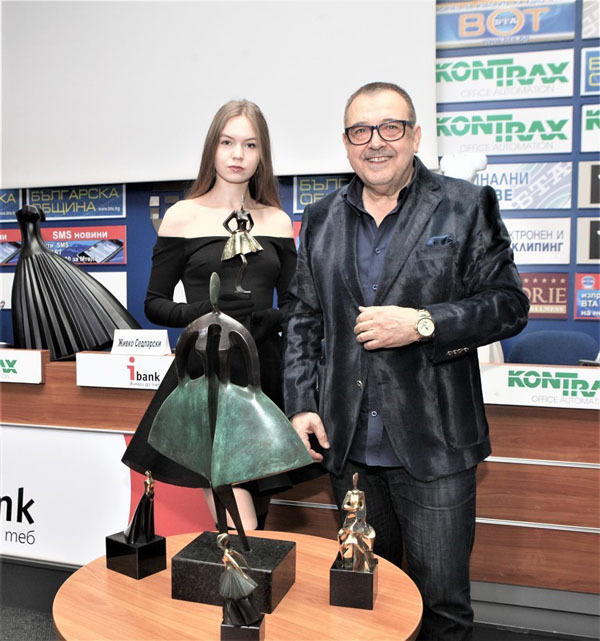 Prof. Lubomir Stoykov with Nicole Prediova with sculptures by Jivko Sedlarski. 6. Prof. Lubomir Stoykov and artist Maya Tsankova, who welcomed the press conference. 7. 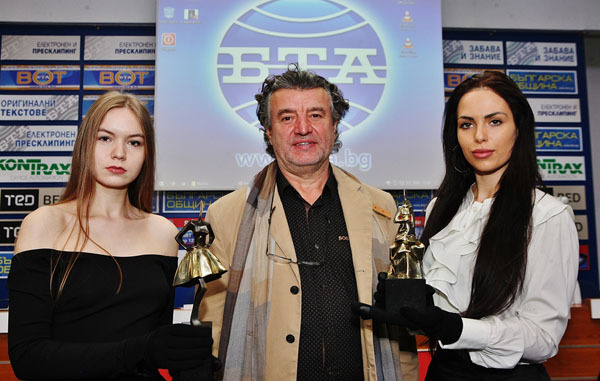 Prof. Lubomir Stoykov with Nicole Prediova (on the left) holding a small sculpture "Rainbow in the Night" and Antoaneta Boyanova (right) holding the sculpture "Spiral Galaxy". 8. – 9. 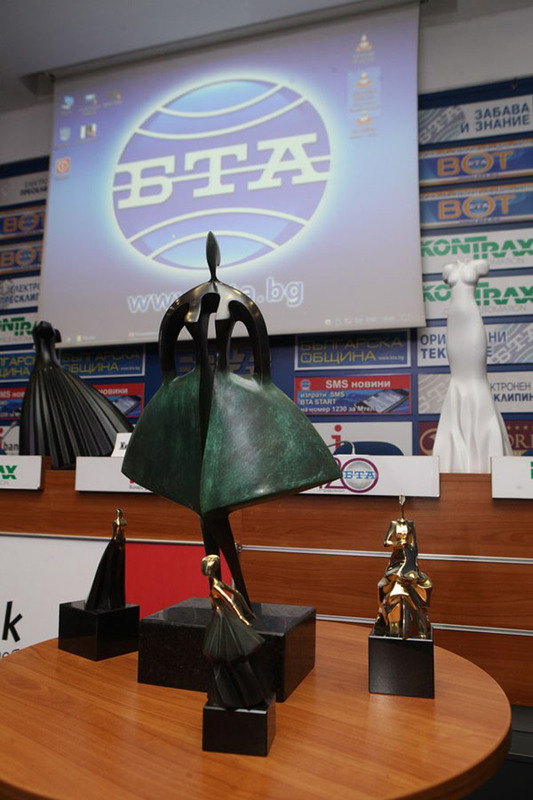 Jivko Sedlarski sculptures, which were presented during the press conference. 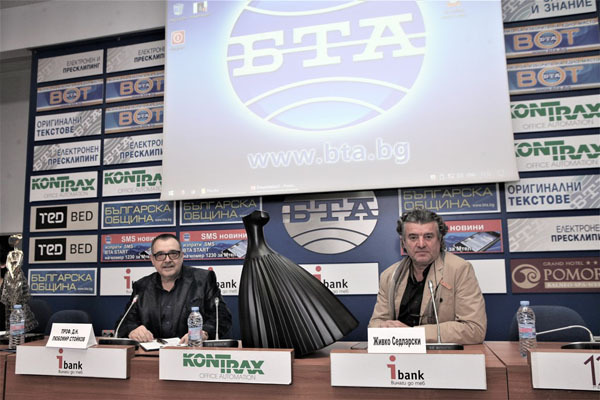 10.Jivko Sedlarski and Prof. Lubomir Stoykov during the press conference. 11. The White Silence sculpture. 13. Sculpture "The Woman of the Fisherman". 14. 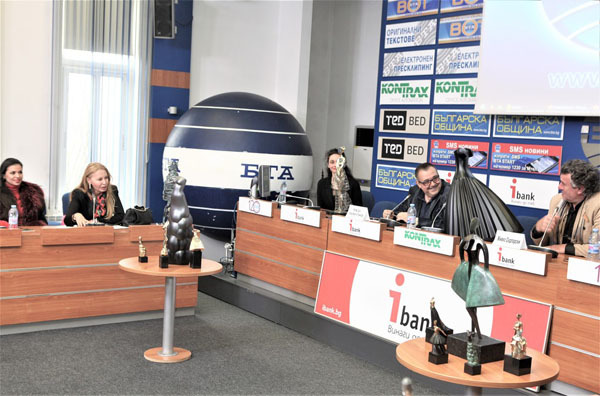 Jivko Sedlarski, Prof. Lubomir Stoykov, Iliana Benovska and Tsveti Radoycheva at the press conference.